Definition at line 34 of file CSparseMatrix.h. Definition at line 43 of file CSparseMatrix.cpp. Definition at line 53 of file CSparseMatrix.cpp. Definition at line 74 of file CSparseMatrix.cpp. Definition at line 39 of file CSparseMatrix.cpp. Referenced by CSparseMatrix::insert(), CSparseMatrix::operator=(), and CSparseMatrix::remove(). Definition at line 35 of file CSparseMatrix.cpp. Referenced by CSparseMatrix::insert(), CSparseMatrix::operator()(), CSparseMatrix::operator=(), and CSparseMatrix::remove(). Definition at line 70 of file CSparseMatrix.cpp. Definition at line 56 of file CSparseMatrix.cpp. 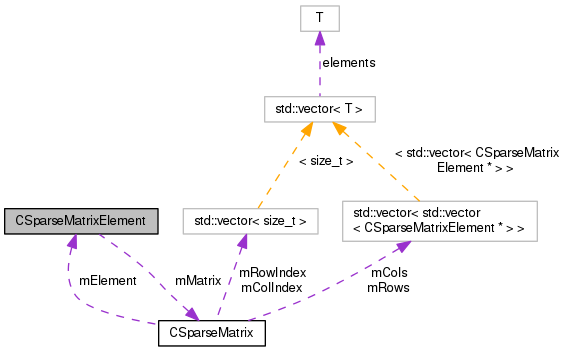 References CSparseMatrix::getTreshold(), CSparseMatrix::insert(), mCol, mMatrix, mRow, mValue, and CSparseMatrix::remove(). Definition at line 73 of file CSparseMatrix.cpp. Definition at line 63 of file CSparseMatrix.h. Referenced by col(), compareCol(), and operator=(). Definition at line 61 of file CSparseMatrix.h. Definition at line 62 of file CSparseMatrix.h. Referenced by compareRow(), operator=(), and row(). Definition at line 64 of file CSparseMatrix.h.